At the heart of the success of Prehendo® tool, there is the semantic annotator which enables Prehendo® to differentiate itself among other equivalent tools. 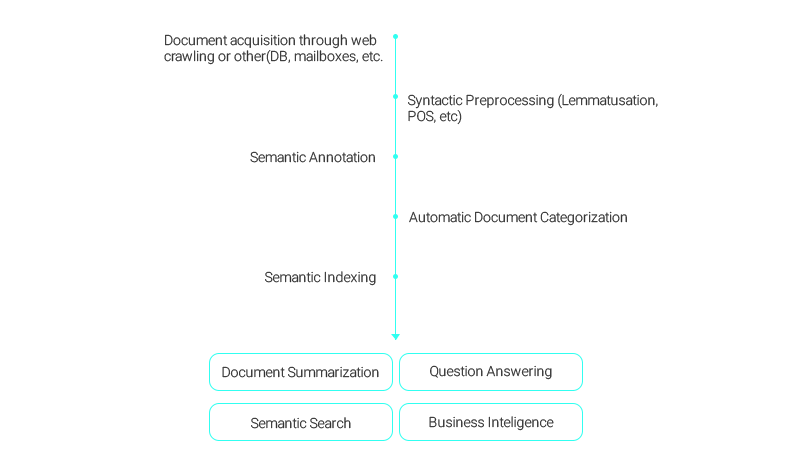 The semantic annotator module annotates documents with regards to a predefined ontology such as a legal ontology or a business related ontology (which is dependent on your business). The annotator annotates group of terms which enables to structure the information. This is how we can structure the information and persist the information in a structured a repository. 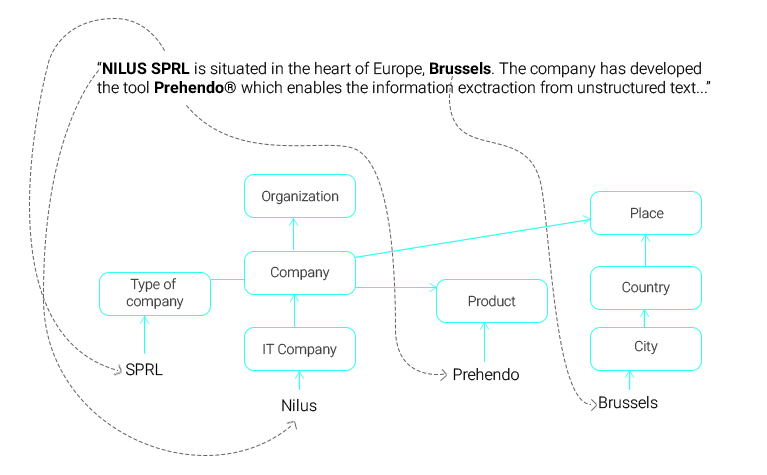 In the example below, one may see that NILUS is a company, SPRL(LTD) is the type of company and the fact that it is situated at Brussels. How Prehendo® performs semantic annotaion? Unstructured text is automatically converted into structured knowledge form by using Prehendo's semantic annotator. This structured knowledge is then used for subsequent steps to query and infer from the knowledge. What we can do with this information? The answer is simply the fact that this gives us an tremendous power for accessing to the knowledge. For instance, if we ask the question "Which companies in Europe are ltd and have a product name starting with Preh. ", our engine can return NILUS as a candidate answer but other conventional engines cannot. The problem with this specific question is that, although it seems simple for human beings, it is not an easy question for the computers. First the system should know that Brussels is in Europe, this information has to be provided to the system and moreover the system has to infer the fact that because it is in Brussels it implies that it is in Europe. Second problem is the fact that the system should know SPRL is the equivalent of LTD. Third problem is the part "product name starting with " which requires a structure to be queried. Conventional search engines cannot cope with this type and level of complexity. Prehendo® tool processes documents in a sequences and provides input to some other consumer modules. The tool starts by crawling the data that you need from Web or other sources. After the data acquisition is done, the system converts the data into knowledge form. This knowledge and raw text is then used by other consumer modules. Document Summarization enables to summarize one or more documents automatically by using statistical methods. The module uses knowledge acquired by pre-processing and decides the most relevant part of the text. This enables to understand the subject and main topics of large amount of documents and results in gain in time. Question Answering enables users to ask structured questions such as "Which companies is Italy are positioned in the construction sector and have a turnover rate gretaer than 500K €?". The module converts this type of complex question into a query language and queries the structured repository. This type of questions cannot be cope with the conventional search engines. Semantic Search Module's advantage compared to conventional search engines is its ability to provide more accurate results, which is measured in precision and recall. The system uses a statistical model enabling to provide most relevant information to the users. Business Intelligence Modules allows to use factual data. We can, for instance provide to the system documents related to some companies and ask to the system statistical informations related to those companies.